...and how fitting it should be about relay! I prefer to write about what I see in my own life, not necessarily about my work at the Canadian Cancer Society, but there have been a few things I would like to share as they have brought my view on life back into focus. 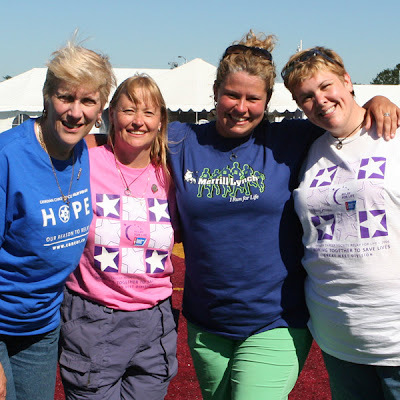 This weekend, the first two of ten Relay For Life events take place in the Kootenay Region of the Canadian Cancer Society; Greater Trail’s and Cranbrook’s. One could think I might say this because of my job, but truly, when I see a Relay For Life event, I see people transformed. Could it be because there is such beautiful honesty in the feelings that are shared? Certainly. Could it be because we will soon be fighting the number one killer disease in our country? Definitely. Could it be because it brings out the best of the human spirit? Absolutely. The pride a community feels, the love that is shared and the warmth of togetherness are all apart of the Relay experience. Relay seems to be much more than an event. For me, it is a yearly moment in time, where, for twelve hours, time is spent sharing and caring and we are all transformed through such openness. When I returned from my April vacation, I was completely shaken by the news of someone very well known passing away so suddenly who had been fighting cancer. In my six years at the CCS and all the people I have been blessed to meet, hearing that was hard for me because Relay means so much to their family. Just two weeks ago, I was hit even harder. I was given the tragic news of another person who has been diagnosed with a terminal cancer. She has such devotion for the CCS and the Relay For Life experience. I recently went to see my dear friend and she quietly said, “Don’t drop the torch, keep on fighting.” She also said, “Light up the night, make an impact, just like we have in the past. Remember?” she smiled. Louise, I will never forget. Relay teaches us that we can make a difference, whatever we are fighting. It is poetry in motion; we encounter kindred spirits on the Relay journey and the splendour that shines within each of us. This week, I am dying my hair “Relay purple” and I am soooo nervous. Especially nervous for when I shave all that purple hair off this Saturday at the Relay at Haley Park track. I will just have to remember what Relay has taught me. To live life in the grace of each moment as those moments make up each day. This time, that moment is the colour purple.